Stimulating a child’s imagination is a great way to nurture learning and good habits. Lab coats make playtime educational by introducing children to the skills and good habits practiced by professionals in the real world. Here are three ways to make playtime a great time to nurture good habits and life skills with kids lab coats. Playing doctor is an imaginative way to learn about compassion and health; however, it is also a fantastic way to nurture writing and fine motor skills in children. Doctors see patients and add new information to their medical history by writing it down in their patient charts. Adding a play patient chart, paper and writing utensil to their medical play set and doctor's ensemble is a great way to inspire them to practice their handwriting skills. Learning to write and improving their handwriting can be fun and exciting when children are learning to take notes on their play pal’s progress. Not only does it exercise writing skills, but it also better prepares them for a bright future. Make learning about proper safety practices fun. Many people do not realize that many professionals that wear lab coats also wear other safety items like goggles and gloves. While playing surgeon or lab technician, children can learn about the best safety practices. Children can learn valuable lessons, like when and why to wear proper safety gear, and they can have fun at the same time. Playing with kids lab coats is a great way to nurture cleanliness and tidiness in children. Professionals who wear lab coats also have to maintain a clean and organized work space. Learning to organize and put things in their proper places doesn't have to be a chore. Children can learn organizational skills while having a blast playing doctor or scientist. Teaching children about returning toys to their proper places when playtime is over is fun and easy when kids want to do it just like the professionals. Children love the fun and excitement of playtime. Why not use it as a time to instill good habits and practice everyday skills? 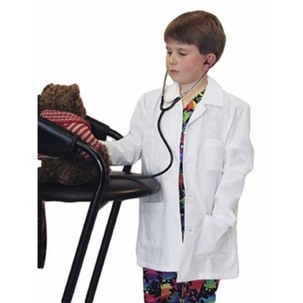 Children can have a wonderful time and take up good habits while playing doctor with lab coats. 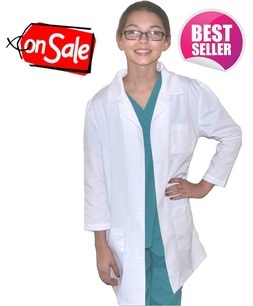 Find out more about the various ways children can have fun and learn valuable life lessons with kids lab coats and scrubs from My Little Doc.